CALGARY - Eric Rogers and Kamar Jorden caught touchdown passes from quarterback Bo Levi Mitchell to lead the Calgary Stampeders to a 25-8 win over the Montreal Alouettes on Saturday. Rene Paredes kicked three field goals in front of 26,440 fans at McMahon Stadium and Rob Maver had a single for the Stampeders (5-0), who started the season with five straight victories for the first time since 1995. Mitchell completed 25-of-34 passes for 292 yards and moved past Doug Flutie into second all-time for most passing yards by a Stampeders quarterback. Mitchell still trails Henry Burris (32,191 yards) for top spot. B.J. Cunningham caught a touchdown pass from back-up quarterback Matthew Shiltz, while Boris Bede kicked a single for the Alouettes (1-4). Montreal starting quarterback Drew Willy left the game early in the second quarter with an apparent hand injury. He was 3 for 4 for 17 yards when Shiltz replaced him at 11:46 of the second. Shiltz completed 16-of-25 passes for 160 yards, while he was also intercepted twice and sacked four times. Willy was seen shaking his right hand at one point before eventually heading to the Montreal locker-room early in the second. Willy also suffered an upper-body injury in Week 3 at Saskatchewan and sat out Week 4 against Ottawa before making his short-lived return. After giving up an 84-yard single to Bede on the opening kickoff of the game, the Stamps responded with a six-play, 75-yard drive that was capped off by a seven-yard touchdown catch by Rogers. 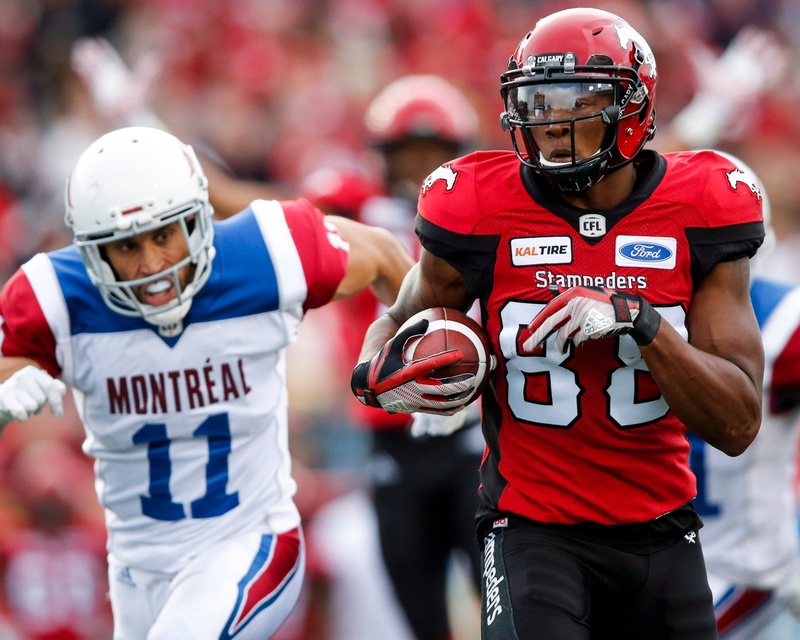 Jorden then caught a short pass from Mitchell in the end zone for a two-point convert to give Calgary an 8-1 lead. Maver then booted a 44-yard punt single late in the first quarter before Jorden caught a 30-yard TD pass three minutes into the second. The Stamps extended their lead to 19-1 with 25 seconds to play in the first half thanks to a 40-yard field goal by Paredes. The Als opened up the third quarter with an eight-play, 79-yard drive that culminated with Shiltz tossing a 20-yard TD pass to Cunningham. A pair of Montreal drives were then stalled as Shiltz was sacked twice, first by Alex Singleton and then by Ja'Gared Davis. Paredes then connected on a 15-yard field goal at 14:33 of the third quarter and then connected on another one from 19 yards out at 13:26 of the fourth to round out the scoring. With just eight seconds to go in the game, Shiltz was sacked by James Vaughters to end another Montreal drive. What was with Bo Levi in the post game interview, very odd behaviour.